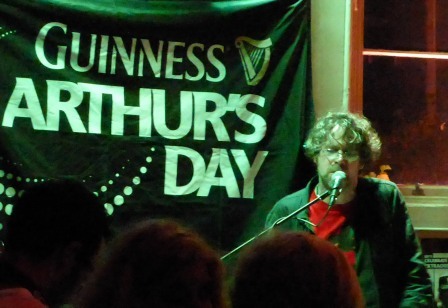 It was Arthur’s Day yesterday, which means hordes of people show up at the pubs at 17:59 to receive their free pint of Guinness. Obviously the company is hoping you spend the evening drinking so they can recoup the cost of that free pint. Not being much of a drinker myself, and certainly not of beer, I found myself instead at a lecture on the Magdalene Laundries in Ireland at 17:59 instead of at a pub. (A tale for another blog post). 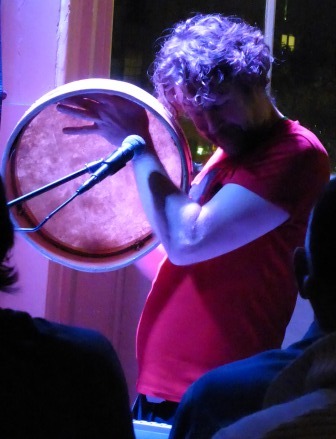 However, not one to miss an opportunity to see Liam Ó Maonlaí, one of Ireland’s most talented musicians, I did stop by The Merchant’s Arch Bar near the Ha’penney Bridge after the talk, as I was in town anyway. As if they don’t make enough money on liquor, despite there being a free pint that evening, why does a ~200ml (~6 oz) bottle of still water or minerals (aka soda) cost nearly as much as a pint of larger? Over 3 Euro! No wonder people drink beer – they get more for their Euro. The bar itself is tiny, by pub standards, but does include a loft area upstairs. It wasn’t entirely packed when I arrived, but did become so about half way through the gig. You would expect some folks to be chatting during the music (there’s always a few), but in this case, it was as if nearly half the place was intent on carrying on a shouting match with their friends/partners (albeit without the animosity of a typical shouting match). At times, it was actually difficult to hear the music. Despite repeated requests by members of the audience who had come for the music, not a chat, and a number of entreaties by Liam himself, people just would not quiet down. I saw one gentleman ask a woman to be quiet and she actually yelled back at him, saying it was a pub and she could talk as much as she liked. Whilst that may be true, there are dozens of pubs in Temple Bar; why would you go to one where music is playing if you don’t want to listen to the music? Is this the way Ireland normally treats its musicians? Maybe some unknown group just off the street from busking, but not someone as talented as Liam, I would have thought. Maybe it was just the night or the small venue. Maybe it’s that so many pubs have music because so many people in Ireland are musically inclined. Whatever the case, even Liam seemed annoyed at several points when he asked for quiet to make a point or sing a softer tune, only to be ignored. Musicians work hard perfecting their craft and deserve a lot more respect than Liam received during that particular gig. If you want to have a chat, find a quiet corner, take it outside, or to another pub, but please don’t spoil the entertainment for the rest of us. Although I hate missing opportunities to see some of my favorite musicians, I will definitely think twice about going to a pub for music on night such as this in the future.